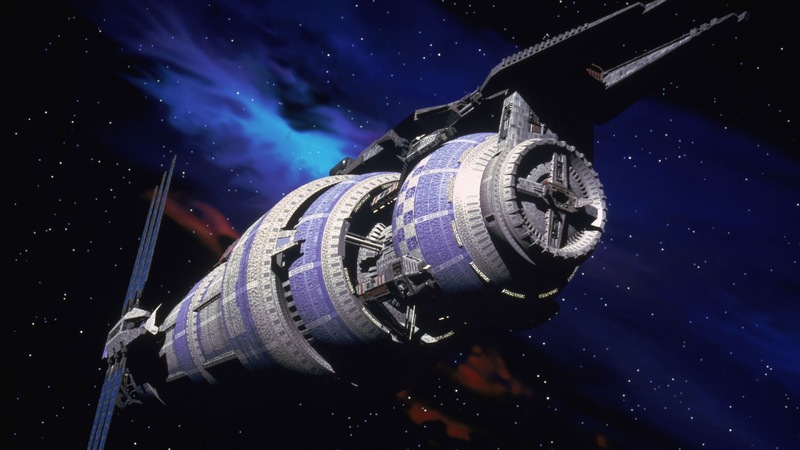 The other day I relayed an anecdote from Ian "Cat" Vincent about how RAW had supposedly written a script for the Babylon 5 TV show. It now appears the story got garbled a little bit; apparently Wilson wrote a script which he felt might have helped inspire the series. Interesting to be sure, but I don't know what to make of it. Wilson seems more interested in talking about space colonies than pursuing his alleged grievance. Does anyone else have information? I guess the name of the show conforms with the Law of Fives. It's doubtful that Straczynski had ever seen or heard of RAW's script. JMS referenced Babylon 5 all the way back to an episode he wrote of the cartoon Captain Power. He had been trying to develop a sf idea, when he realized he could take his micro- and macro- ideas, place them on a space station, and let it go. He said the epiphany came to him in the shower and he ran out still dripping wet to get the details down. JMS has been a science fiction fan for a long time with full knowledge of the genre and its history. 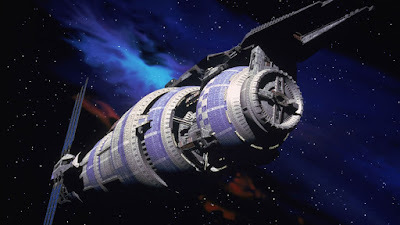 The major arc of B5 was EE "Doc" Smith, with references and tributes to Bester, Asimov, Saberhagen, Moorcock, and Lovecraft scattered throughout. This hasn't changed, as the Netflix show he made with the Wachowskis is an obvious love letter to Ted Sturgeon. Captain Power was live action for me. I don't remember a cartoon. Just live post-metal war corny 80's action, with special VHS-enabled plastic electronic weapons. I have the first tape, still. Right next to The Three Stooges on my shelf. "more interested in talking about space colonies than pursuing his alleged grievance"
I think that is called forbearance. RAW was acknowledging a lesson in the game of scribe warfare? Giving away his 'finer'st unpolished ideas on spec...like a pot smoker is apt to do. What would Heinlein do? It breaches his rules somewhat? RAW was a broadcaster of ideas, and could not contain himself to the rules of writing for profit. It is easy enough to convince yourself that you've had an original idea. I get them in the shower too. Vampirates. I'm 99.99999999999% sure that someone somewhere has transgressed phonics, pop-culture, history writ-large, and followed up in semi-edited English on this one. I don't even want to Google it. Sorry, I confused Captain Planet for Captain Power. Too many superheroic and kids sfnal captains running around. Who can keep them straight?